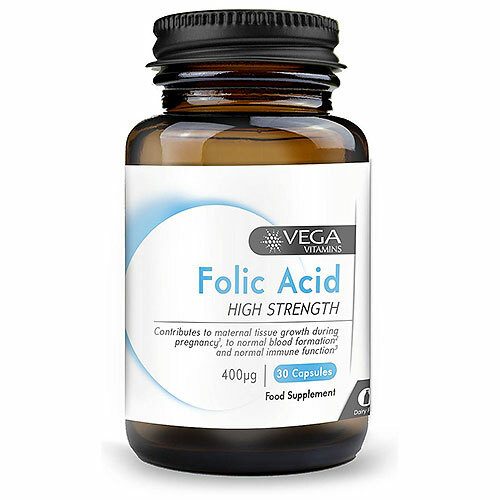 Vega Vitamins Folic Acid is a high-strength supplement that provides 400mcg of folate per single capsule. Folic acid aids in the production of DNA and RNA, the body`s genetic material. Folic acid is especially important when rapid synthesis of DNA is required during periods of high growth, such as infancy, adolescence and pregnancy or in tissues where cells are dividing rapidly, such as the bone marrow, digestive tract and skin tissues. Vega Base (Acaia Gum, Fruit Juice Concentrates (Aronia, Apple, Elderberry, Blueberry & Blackcurrant)), Vegetable Capsule Shell (Hydroxypropyl Methylcellulose, Colours (Titanium Dioxide, Copper Chlorophyllin)), Anti-caking Agent (Magnesium Stearate), Folic Acid. As a food supplement for adults, take one capsule daily with food or as directed by a healthcare professional. Do not exceed the stated recommended daily dose. Suitable for kosher, vegan & vegetarian diets. If you are pregnant or have any medical complaint, consult your doctor before using this product. 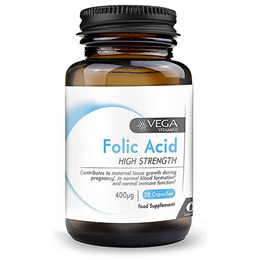 Below are reviews of Vega Vitamins Folic Acid - 30 x 400mcg Capsules by bodykind customers. If you have tried this product we'd love to hear what you think so please leave a review.